An L-shaped oak beamed former farm cottage which is set in five acres, has been sensitively converted to include all modern comforts but retaining its original character. All bedrooms are centrally heated with private or en-suite bathrooms, tea/coffee making facilities, colour television, clock radio, hair dryers, irons and electric blankets, there is also a downstairs room. An Aga cooked full English or Continental breakfast, with chickens laying free-range eggs is always available. 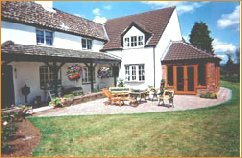 Situated in a quiet rural position but close to the main A449 Worcester/Kidderminster Road it is within easy reach of Worcester, Birmingham, the M5 and the Cotswolds. An evening meal is offered if booked in advance but there are plenty of pubs and restaurants in the locality, some within walking distance. Guests are more than welcome to use a private sitting room with television and log fire, sun lounge and sun terrace. Crossway Green is within easy reach of the best countryside that Worcestershire offers and in close proximity to its major attractions. There is an excellent pay and play golf course, leisure centres and major shopping centres nearby. The area offers miles of way marked walking paths from easy going nature trails, riverside paths and forest trails to long distance walks. The countryside also offers many opportunities for horse riding and cycling. There are numerous waterways and miles of peaceful riverbanks and canal towpaths. The West Midlands Safari Park is close by along with Britain's premier steam railway - The Severn Valley Railway that holds several major events throughout the year. Trains operate at weekends all year long and daily from mid May to mid October. This beautifully restored railway offers a 16-mile journey through glorious countryside from Kidderminster to Brignorth. The City of Worcester boasts a magnificent Cathedral, the splendid Guildhall, Royal Worcester Porcelain, and The Commandery Civil War Centre, Museums and landscaped parks. Worcester Racecourse with its exciting National Hunt programme and the County Cricket ground offers an exciting day out for sports lovers. Packed lunches are available and special diets catered for. The downstairs twin room has a separate entrance suitable for the those who are less mobile.